Shaw (YogaLean), founder of the yoga instructor training company YogaFit Training Systems, provides clear and useful advice for athletes in this guide. According to Shaw, athletes who don’t practice yoga are “competing at a disadvantage.” As each sport strengthens particular parts of the body, imbalance and weakness in other areas can occur. To counteract this effect, Shaw prescribes yoga. The book provides sport-specific yoga sequences (with accompanying photos) for, among others, football, volleyball, baseball, hockey, running, golf, CrossFit, cycling, and kickboxing. Shaw explains how each pose benefits the particular sport; for example, the revolving chair pose trains torso rotation for an effective tennis or golf swing. Sections on breath control, visualization, meditation, restorative yoga, weight training, and core and balance poses round out the program. (Core, in the author’s words, is the “epicenter” of total body strength, and balance is “the root” of movement.) The text offers a sensible route to enhancing productivity and longevity in one’s preferred sport. Shaw’s straightforward approach will appeal even to athletes who are new to yoga or skeptical about how the ancient practice and mainstream sports can team up. Bring the strength and breathing power of yoga to the sports you love—and seriously up your game! Yoga routines designed specifically for swimming, running, cycling, golf, tennis, baseball, football, volleyball, basketball, skiing, snowboarding, weight lifting, kickboxing, boxing, CrossFit, and more. Whether you’re a professional athlete, a weekend warrior, or a pick-up game enthusiast, yoga can dramatically affect your athletic performance and improve your alignment, balance, core stability, strength, flexibility, agility, endurance, lung capacity, and mobility. In this motivating and practical guide, Beth Shaw provides short, sport-specific yoga routines designed to help counter tight muscles, overuse injuries, and musculature imbalances. By adding a quick yoga routine to any workout, you will increase your overall strength and health, and achieve your personal best. My intent with this book is to impact you and your sport. 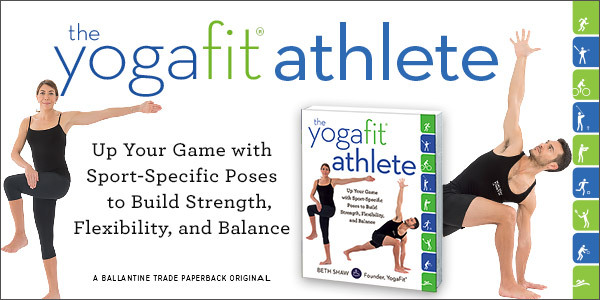 In this book, you will complement your sport with sport-specific yoga poses, which can enhance​ your performance ten-fold and reduce the risk of injury. As much as you spend time fine-tuning your swing or shot or general form for your sport, you are at the same time likely building up a “strong side.” Consistent body movements, such as we do in any sport, create habitual tightness in our muscles (often favoring one side), tendons and ligaments. Yoga is the perfect complement to release tension, tightness and stress, balance your strength and help create better balance overall, even in sports where a strong side is inevitable or even the point- like golf or baseball, for instance.